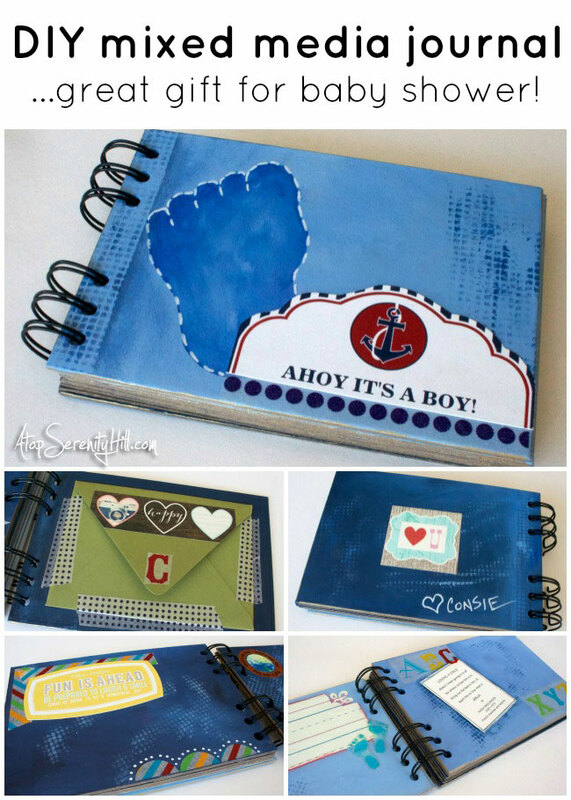 I had such a fun time making this mixed media baby journal for a dear friend’s daughter! It was my gift at the baby shower and I can’t wait to try making more for different occasions. I spent so much time playing with all my stickers, papers, paint and washi tape, that I never took any step by step pictures. Instead I made a video of the book to show you what I did. I hope it will give you a start at creating your own version! Enjoy! Great video. I shared on FB and Twitter! I LOVE how you made this adorable book. I’d love to try to make one for my cousin. Went to Michaels but couldn’t find the blank book there. Can you tell me what section you found it in? Also, were you able to take the book apart or did you paint around the spiral? Thank you for the unique idea. Thanks, Vicki! I found the books on an endcap in the scrapbook section. Yes, I did take the pages out of the spiral to paint them. There is a slit in the spiral binding that allows for that. The book went back together really easy when I was all done. Hope that helps! Thank you so much. Can’t wait to start this. Love all your work. You are so talented!!!!! Thank again!